Red Lobster ran no advertising in the Super Bowl, but scored a BIG WIN. 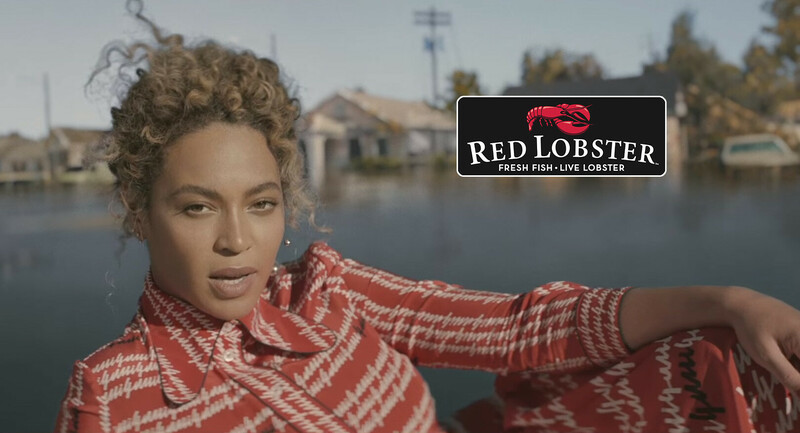 Beyoncé song lyrics boost Red Lobster sales 33%. After Beyoncé called out Red Lobster: in her “Formation” song lyrics, the restaurant chain experienced an impressive upswing in visitors and sales. The 33% sales boost is just getting started. It will likely be surpassed even further as the song and music video continue to gain popularity and recognition with an audience dedicated to music. A spokesperson for the company also claimed that the lyric, which says that a meal at Red Lobster is a reward for a job well done in bed, helped the company trend on Twitter for the first time ever, thanks to hundreds of thousands of mentions. All told, the brand’s name was mentioned over 300,000 times just over Super Bowl weekend. Beyoncé’s music video on YouTube already has more than 30 million views and features a series of off-color lyrics about enjoying the popular seafood restaurant. The music track is available on Tidal. While Red Lobster could have capitalized even further had they been prepared for a social media flurry, the proof is in the biscuits. Brand mentions in song lyrics and other branded entertainment integrations are proving more effective and possibly a better ROI than even the top Super Bowl media buys. This is nothing new for Bey. In 2013, a week after Beyoncé danced in H&M swimwear in her video for “Standing on the Sun,” the clothing brand experienced its highest-ever spike in social media discussion, mostly centered on the Bey video. Then when social media caught her wearing a pair of distressed H&M jeans…boom…the product sold out almost immediately. Red Lobster, based in Orlando, Florida, has more than 700 locations in the U.S. and Canada.